Compared to some other brands, Sennheiser just aren’t as prominent in the budget mic ranges. It’s only when you make the step up into the midrange condenser market that you begin to find more Sennheisers on offer – which is great, because the German brand know how to make audio equipment worth using! If you ever needed proof, just take a look at the MK4. First released in 2011, this popular large diaphragm condenser is still going strong, especially after a few new upgrades. As mics go, the MK4 is quite attractive – not a boutique style mic like something you may find from brands such as Aston or Blue, but ultimately it looks pretty good. It features a clean satin-finished silver chassis with a large black side-address metal grille. No switches or controls to mention, just the simple Sennheiser logo reminding you that this is, indeed, a Sennheiser. The relatively short and squat body is made entirely from metal and, at just over a pound in weight, the MK4 feels like a quality unit. While there is certainly nothing wrong with Asian-made models, knowing that this microphone was made in Germany – in the same factory as high-end Sennheiser and Neumann mics no less – just adds to the quality. Lifting the lid on the MK4, we find a large 1” diaphragm capsule housing a 24-carat gold-spattered diaphragm. A plus is that this capsule features an internal shock mount to reduce the mic’s self-noise. Meanwhile, Sennheiser themselves are quick to point out that the capsule is made in the same medical level ‘clean room’ as the high-end Sennheiser and Neumann condenser transducers – so you know it will be a reliable mic straight off the bat. This is backed up when we look at the specs. The MK4 has a fixed cardioid polar pattern with a listed frequency response range of 20Hz to 20kHz and a max SPL of 140dB. Aside from this, it isn’t the most feature-rich of mics, especially compared to others in this price range. There’s no attenuation pad switch or frequency cut switches to mention. It does arrive with a stand mount and a basic mic pouch, which is the least we would expect. Finally, note that with the XLR connection, 48v phantom power is necessary to run this mic. While it lacks a few of the extra features that can be handy, there’s no need to worry – the core performance of this sub-$300 mic is sensational. It lacks a big personality, which is actually a plus in a studio craving transparency, and vocals come across as neutral, crisp and clean, making recording with this device a pleasure. It’s smooth and well balanced, with no harshness in the trebles. While Sennheiser state this mic is suitable for stage use, we find it is very sensitive and much better suited to calmer studio recordings. When there, it’s very capable of handling a wide range of applications, from spoken word and singing to recording acoustic instruments with ease. The word workhorse is thrown around quite a lot these days, but the MK4 is exactly that! While the lack of a few common features may put off some users, the truth is they aren’t needed. The MK4 is an excellent no frills microphone that does the basic things exceptionally well. The build quality, sound when recording, and overall performance is stellar and, for the price, this condenser mic is very hard to beat. 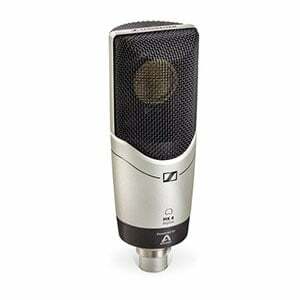 For more info about the Sennheiser MK4, click here. For more Condenser Microphone Under $300, click here.